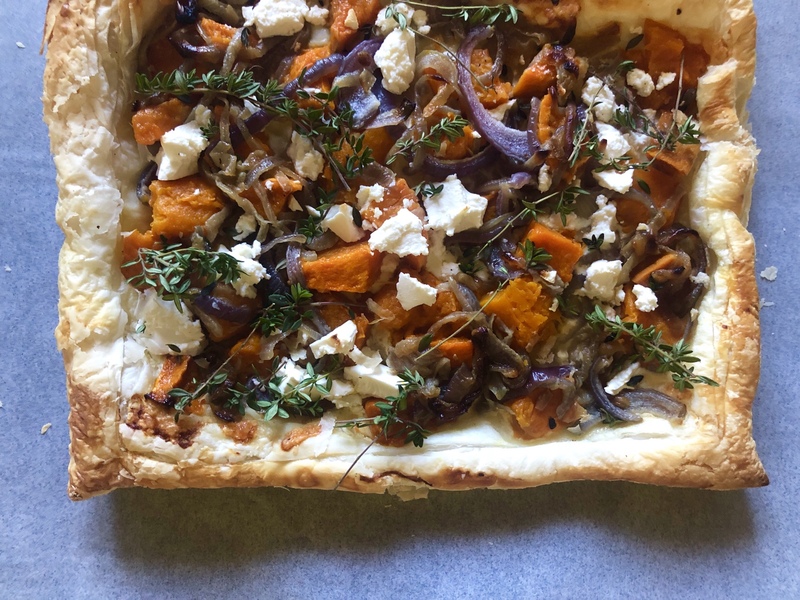 Roasted pumpkin, sweet potato, caramelised onion and creamy feta make this delicious tart so tasty and perfect served with a simple green salad for either lunch or dinner. Pre-heat oven to 180 degrees Celcius (350 degrees Fahrenheit). In a roasting tin add sweet potato and pumpkin, drizzle with olive oil and bake in oven for approximately 30 minutes until the vegetables are cooked through. In the meantime finely slice the red and brown onions and add to butter in a heavy based saucepan and cook low and slow for 30 minutes until the onion is golden and caramelised. Remove from heat. Mix Parmesan cheese and cream together, season with salt and pepper. Scour a border around the puff pastry sheets about 1 inch from edge. Spoon on cream mix and smooth to the border. Layer with caramelised onions and top with roast pumpkin and sweet potato. Crumble feta cheese on top and scatter with thyme leaves. Brush pastry edges with milk and bake on an oven tray laid with a sheet of baking paper for approximately 20 minutes until pastry is golden. Enjoy! First, it looks delicious. Second, after reading the ingredients I know it is. Thank you for the post. This recipe sounds delicious. I’ll tuck it away until autumn when pumpkins are readily available. oh wow that looks and sounds so tasty. Will need to try. Thank you for sharing. Wow, that looks amazing, and has two of my favourite foods…caramelized onions and feta. Looks as delicious as it looks easy to prepare. Nice.